How would you feel if you were forced to go to war? When the number of men volunteering for service started to drop, men like Te Rauangaanga Mahuta were forced to either enlist, or face jail. The young men of Waikato-Maniapoto did not participate in the First World War because tribal leader Princess Te Puea Herangi had encouraged many of her people not to enlist. She, with many others, was following her ancestor King Tāwhiao's call to his tribe never to fight a war again after he had made peace with the Crown. When conscription began the enlistment age went from twenty to eighteen. They needed more soldiers, and they were going to get them. When they came calling in the Waikato, those who said no were arrested and sent to Narrow Neck Military Camp in Auckland for training. One of them was the fourth Māori King Te Rata's youngest brother, Te Rauangaanga Mahuta. His attestation isn’t like the ones handwritten by men volunteering to serve. It was typewritten, and because they didn’t know much about him, barely any of the questions were answered. They forced him to sign. He marked an X. You have been given Te Rauangaanga's attestation form where he has refused to sign his name - he did not want to go to War. You are now tasked with discovering more of the story behind Te Rauangaanga Mahuta. How much of his story can you piece together? The suggestions below will help you on your research journey. The How We Find It Fact Sheet will also be a helpful tool in helping you discover the pieces of Te Rauangaanga's puzzle. You're in luck, Te Rauangaanga served in the New Zealand Army and so his records will be able to be found online at Discovering Anzacs. This is your most important search. Collect as much information as you can. Once you've found Te Rauangaanga's Serial Number move to Archway and search for his service documents there. Nga Ra o Hune or The Days of June traces Te Arohanui Mangu's journey to find out more about her grandfather Te Rauangaanga who was one of the 111 men arrested for his pacifist stance. Te Rauangaanga was the youngest brother of the fourth Maori King Te Rata and he was arrested at Te Paina. Watching this documentary will help you understand this very important story. what did conscription mean for tainui? Conscription is compulsory enlistment for military service. The Military Service Act 1916 was the beginning of conscription but only for Pakeha soldiers. Conscription for Maori was applied in 1917 and to one area only - Waikato Maniapoto. Princess Te Puea Herangi was instrumental in leading the resistance to conscription. Use Google to find out more about Te Puea. Discover more parts of Te Rauangaangaa's story. what were the words of king tawhiao that tainui held fast to? In June 1860 Tāwhiao became the second Māori King. Tāwhiao's reign was dominated by the consequences of the British invasion of the Waikato in 1863. As a result of this war Tāwhiao and his people became refugees in Ngāti Maniapoto country (which became known as the King Country). About 1.2 million acres (just under half a million hectares) of Waikato land was confiscated by the government in 1864. After he had finally made his peace with the Crown in 1881, he forbade Waikato to take up arms again. What were the guiding words that he used? find the article describing what had happened at te paina pa.
A crowd greeted police when they arrived at Te Paina on 11 June 1918. After being escorted into the meeting house, they read out the names of those who were to be arrested. Nobody moved and Te Puea made it clear that she would not co-operate. King Te Rata's 16-year-old brother, Te Rauangaanga, was also seized. Police caused great offence by stepping over the King's personal flag, which had been protectively laid before Te Rauangaanga. Use Papers Past to locate articles that describes this event. Do you think this is a fair reporting of the event. Records of Tainui soldiers conscripted during the First World War are not able to be searched for on Cenotaph. Use Discovering Anzacs to locate the records of the soldiers who were called in the Ballot. Identify the methods of passive resistance that Tainui devised to subvert the enlistment process. 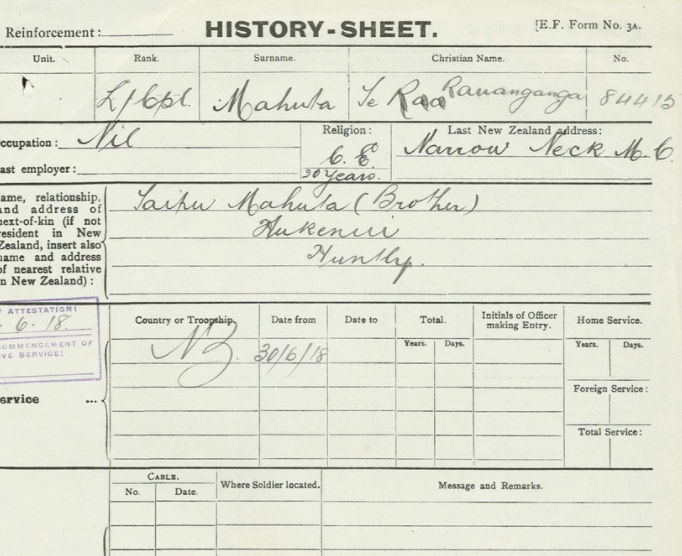 You can see several on Te Rauangaanga's file - Refusal to sign his name; "forgetting' his parents names; "forgetting" his place of birth or age. Mis-spelling of names happened on both sides - the pakeha side from lack of attention to detail and the Tainui side as a strategy to avoid identification. Ask why this story isn't told? what happened to the soldiers imprisoned at narrowneck prison? Find Narrowneck Prison on the map. What happened to soldiers sent to Narrowneck? How did Princess Te Puea show her support to the men imprisoned there? Mahuta's Attestation is connected with the story of Te Rauangaanga Mahuta. The original document is held by Archives New Zealand - Te Rua Mahara o te Kāwanatanga #R10927772. Despite best efforts relatives of Te Rauangaanga were unable to be contacted. Te Rauangaanga Mahuta was imprisoned at Narrow Neck Camp. Research starting points for Te Rauangaanga's Story.